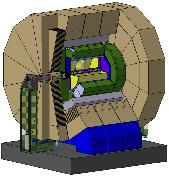 ILD is a detector for the international linear collider, ILC. ILD combines excellent tracking and finely-grained calorimetry systems. This gives ILD the ability to reconstruct the energy of individual particles, known as the Particle Flow approach. ILD has been developed for high precision event reconstruction, as needed by the science program at the ILC. The ILC will be a particle accelerator to collide electrons against positrons at energies between 250 Gev and 1 TeV (upgrade). Because the positron is the anti-particle of the electron, the electron-positron pair will annihilate into pure energy. Depending on how the quantum mechanical die plays out, the pure energy could then turn into something interesting, such as the Higgs boson, or even new, yet unknown particles. Because the starting point is a pool of pure energy, when a Higgs boson emerges, it will be accompanied by relatively few other particles, which will make it particularly easy to identify the Higgs boson. This is very unlike the case at the LHC, where the proton-proton collisions result in many fragmented pieces of what was originally a proton, each fragment producing its own shower of particles. Conventional particle accelerators are arranged into a ring, where the particles are gradually accelerated as they go around the ring many times. 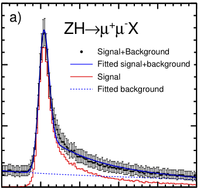 This method faces a limit as it becomes progressively more difficult to accelerate particles at higher energies, because the particles lose energy by emitting radiation when they are bent around the ring; this phenomenon is known as synchrotron radiation. 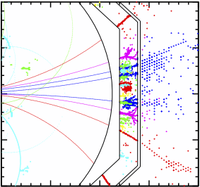 To overcome this difficulty, the ILC accelerates electrons and positrons in a straight line. The challenge then is to develop accelerators which are powerful enough to impart the desired energy into the electrons and positrons in just one go. To learn more about the global effort to design the ILC accelerator components, visit the ILC web site.